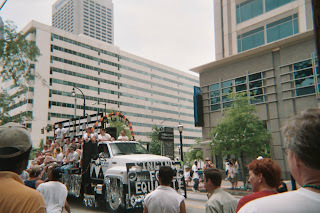 A state superior court in Georgia has ignored Section 230 of the 1996 Telecommunications Act, and commanded, through a restraining order, that a discussion forum Matthew Chan remove a board allowing criticism of alleged copyright troll (and, ironically, poet) Linda Ellis. The board apparently had appeared on a website called “Extortion Letters”, link , which would provide information on shakedown copyright trolls. Electronic Frontier Foundation has a story and op-ed about the situation here and tweeted it today, saying that it threatens message boards (and maybe blogs) everywhere. EFF expects the Georgia Court of Appeals to uphold federal law and overturn the order. Eff discusses the “true threat test” and forum moderation issues in the article (and some of these same points would logically apply to Blogger and Wordpress). EFF posted a typical “demand” letter from Ellis by “Turnaround Schools” here. It also linked to a about the copyright infringement letter concerning “the Dash Poem” from April Brown, about a family that had put the poem in a funeral tribute on a blog, link here. There is some discussion here about the material churches and Christian organizations can use in publications, and there is indeed very strict copyright control in the church hymnal (both music and words) and liturgy world of what is published for congregations to use; I have seen this in practice in my own dealings with many churches which I have attended. It seems that blogs that post this poem literally face “Righthaven-like” response. I’ll decline. But I can’t imagine posting something cute that people will use and going after them. One time I composed and published a joke ditty “Heterosexuality is incompatible with military service” to make fun of the Pentagon’s infamous “123 words” from 1981. The idea of going after people who copy it would just be beyond comprehension. But there are people who do this. To me, the value of letting people circulate a piece like this free (and the political effect it has) is worth a lot more than “monetizing” it. Yet, I get complaints from people who say they can’t make money working with me, and that I live in a dream world because I don’t raise a family and don’t have to hucksterize! (This even happened yesterday.) Figure this out!! Are we in a hyper-competitive, individualistic world where a lot of people can’t make a living (or raise kids) without some sort of scamming or coercion? Here’s Matthew Chan’s video on extortion letters. They seem to be "common". Maybe some of the letters he has gotten calls about were from Righthaven. This is the first case I am aware of where Section 230 and copyright issues (usually separate) occur together. 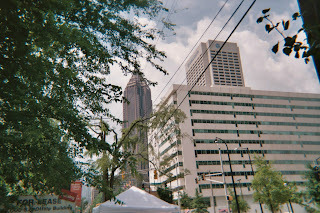 For the record, the picture is mine, downtown Atlanta, 2004 (I needed my own photo from Georgia for this posting). It's Braves Country. Timothy B. Lee has a more detailed story on Ars Technica, discussing the nature of Chan's own posts and those of some of the forum contributors. Chan could be held responsible for damaging aspects of his own posts but not for others whom he allows to post on his blog. Apparently posts from both Chan and at least some forum contributors contained language that could be construed as of a threatening nature. The link to the new story is here. The title is telling: "'I made some stupid posts'. Anti-troll site gadded after threats against poet". This article appears in the "Law & Disorder" and "Civilzation & Discontent" column at Ars.